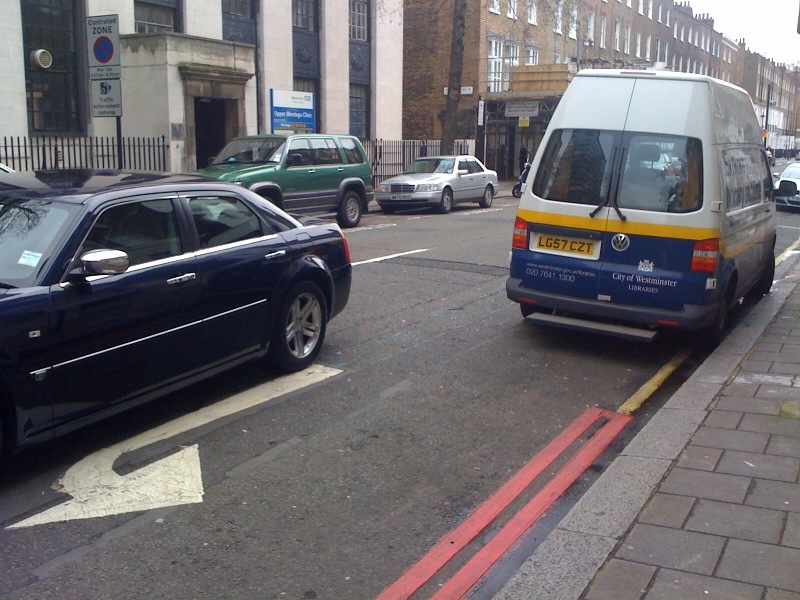 Last week, we published a post showing a Westminster Council car parked on a single yellow line, at lunch time and on a working day, when parking in this manner is illegal before 6.30pm. As we would expect, the car was not issued with a penalty charge notice (PCN) or taken away to the car pound, although it stayed parked on that single yellow line for a good hour. 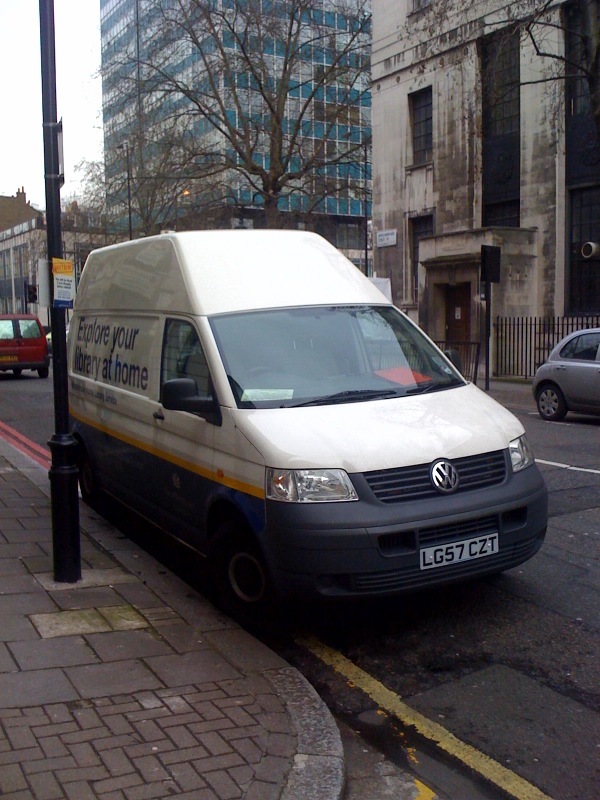 Well, while having our daily promenade in the streets of Westminster at lunch time yesterday, we spotted another Council vehicle illegally parked on a single yellow line. This time, it was a naughty van driver who took the initiative to break their employer’s parking rules on Upper Montagu Street, London W1, thinking that they wouldn’t be seen by some cheeky continental motorcyclists. We initially thought that the driver had only committed a simple and straight forward parking offence, until we walked towards the back of the van and noticed that there was a white arrow painted on the ground that was pointing right in the opposite direction from that of the front of the vehicle. So not only had this Westminster Council fat cat illegally parked their van on a single yellow line, without of course being issued with a PCN, but they also appeared to have driven on the wrong side of the road to reach their illegal parking space! Oh, sacré bleu, mon cher monsieur! This is just incroyable, n’est-ce pas? A parking offence together with a clear breach of the highway code! We wonder how many points should have been taken off the driving licence of this Westminster Council employee, in addition to receiving a parking ticket. But because Westminster staff have always felt above everyone else, why would they bother driving and behaving like everyone else? This is another example of Conservative Councillor Danny Chalkley’s firm, fair and excellent parking policy. One set of rules for the public and another for himself, his colleagues and his staff is indeed very fair. Let’s not forget that being firm and fair for Chalkley also includes holding a free Westminster wide parking permit for his car and that of his fellow Tory colleagues, while he takes an inmense pleasure in stealth taxing motorcyclists to park with the socially exclusive pay by phone Verrus system and increase parking fares for motorists to help his council recover a £22 million budget overspend. Remember, that’s called a firm, fair and excellent parking policy. So rule number one for everyone from now on: take a camera with you every time you visit the streets of Westminster and send us some nice and interesting pictures for publication! Oh la la, we have never enjoyed walking in Westminster so much since Chalkley has introduced his motorcycle parking stealth tax! We have discovered a complete different way of visiting a foreign city, that is on foot, taking pictures and videos of its entertaining roads! That is, of course, until Chalkley decides to stealth tax pedestrians for using what he may believe to be an increasingly demanded pavement space.